February is a natural choice for discussions of friendship and kindness with Valentine's Day on the way. Children aren't born knowing how to think about the feelings of others- that is something we teach them. The good news is, it absolutely works when we do spend the time to model and teach our students. Take a look at this post if you want to see some research and links to ways to incorporate this at school. 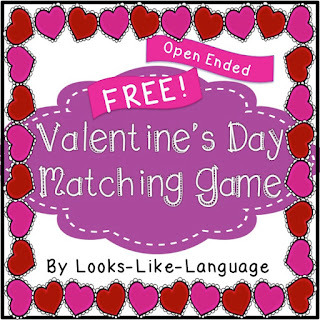 I'm sharing the love around this month by adding my open ended February game freebie to my TpT store. While it practices color matching, it can be used to work on any skill with the younger set. The worksheets that support it are only available on my blog, however! One new addition will be coming next week. To get the rest of the worksheets this month, you will need to get my newsletter. I'm running out of time before the holiday! Want the whole set at once? Keep reading! If you have signed up with your email (top right box) to follow my blog and get my newsletter, you will be treated to the entire Valentines Color Matching game and worksheet set in one download! The link will be in my weekly newsletter. My Valentine's present to you- saving you some time and letting you get prepared ahead of time. With such busy lives, timesavers are always a help!